Just for the HALIBUT…. or perhaps for two King Salmon. Garrett McLean, 20 year old expert. Cleaning the catch is an admirable talent. It’s all about the fishing. Alaska is THE fishing ground of the Northwest. The warm months bring fishermen from the northwest true, but really from everywhere: Florida, Ohio, Vermont, Minnesota, Colorado, even Germany. RV Camping is the lodging of choice, and there are grand RV palaces, trailers, pick-up caps, tents; I even saw a guy sleeping on a picnic bench with his gear in his hand. Daylight is practically all day in the land of the midnight sun. Never really gets dark in the summer months, just less light. The sun sets in the west but in a short time it’s coming back around and it’s dawn. Unlike the stories one hears, you can get accustomed to it quite easily, especially if you like to fish! Garrett McLean was born in Alaska twenty years ago to Bruce and Charlene McLean. “The art of fishing and cleaning fish comes naturally to him,” Bruce says. “At three he said he wanted to go fishing so I took him along. 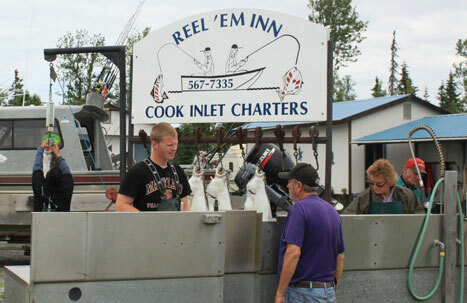 He never looked back.” Garrett was cleaning fish when I met him at Reel’ Em Inn, Ninilchik, Alaska. Huge Halibut. He is a full time student at University of Alaska but in the summer he very happily works fishing and cleaning the catch at his Mom and Dad’s charter fishing business. An Anchorage “Fishing Uncle” at Deep Creek State Recreation Area, Ninilchik, was cleaning up his gear to go home when I asked him how he did (fishing.) He told me he did very well. “You freeze your catch?” I asked. “Usually, for home,” he replied “but this year I have a special project. My nephew is getting married soon. The reception is going to cost $13,000. He asked the caterer what he might do to cut costs. The caterer replied: ‘You bring me 70 lbs of salmon and 70 lbs of halibut and it’ll save you 25%.’ Fishing Uncle heard this and said: ‘OK, tell you what. I’ll go fishing and I’ll catch you 70 lbs of each and that will be your wedding present.’ How special is that I ask? 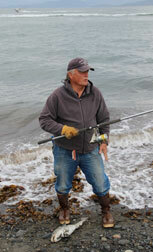 A Homer, Alaska “Cod Catcher” was up to his knees in surf when I found him with a fresh caught cod. “They’re bite’n plain hooks,” he laughed. What a sight to see. It is a banner fishing year here, everybody is fishing Alaskan waters and nobody goes home empty-handed! A “Subsistence Fisherman” came to the Kenai Peninsula and happily fished until he caught two KING SALMON (roughly 225 lbs of fish). This will keep him in fish for the entire winter. Happiness is bringing home the salmon! of sockeye salmon passing up river to spawn: 231,000 passed the counter, Sunday July 17, followed by another big surge, 177,000, Monday. On less fortunate years, the peak totals don’t rise beyond 100,000, meaning this is a banner year on the Kenai Peninsula for sports fishermen, dip netters, set-netters, subsistence and commercial fishermen alike. Even with dip netting, too many fish are still escaping to swim up the Kenai River and spawn. By opening the corridor to commercial fishing over the weekend, Fish and Game attempted to diminish the flow. Too many spawning fish in the river taxes the food supply, causing a die-off of juvenile salmon and hurting the future runs. It’s all about the fish. Icy fresh, sweet, grilled fish with olive oil and dill. Perhaps a touch of heat:cayenne, Tabasco, chili powder. Do what suits your fancy, but do it very lightly. No need to gild the lily. 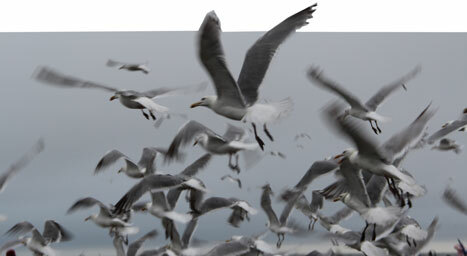 Seagulls catch carcasses left on the beach, crabs get the rest with rising tides.